autumn is so pretty, no? it´s my day off but still have lots of things to do blogwise. Love the outfit and the shoes are GORGEOUS! Love that jacket, it looks super cozy! Great outfit!! Love the red shoes! Amazing!! shoezzy ! love it <3 waiting for the same hat in my post box (hum,not exactly in the box.. chi)!! it looks great. Adore how your platform heels subtly match your striped knit. Tres chic! beautiful outfit! i love the sweater and the shoes! OMG!!! those shoes are amazing!!!!! beautiful pics!! the red shoes and the shearling jacket are just amazing!!!! very beautiful! love that the color of the shoes appears in the jumper as well! Besonders dir roten High Heels zu dunklen Strümpfen - perfekt! I HOPE YOU VISIT MY BLOG,DARLING !! crazy for your red shoes! new post on my blog: I'm waiting for your comment! I love those shoes, the design and the rich burgundy colour! :) I went to a Rihanna concert in cologne, gonna have a Meet&greet with Jessie J tomorrow in berlin.. so pretty exiting week, hope you havin a nice week too! So inlove with that velvet heels! I love this style ... The shorts, socks and shoes ... Cute! 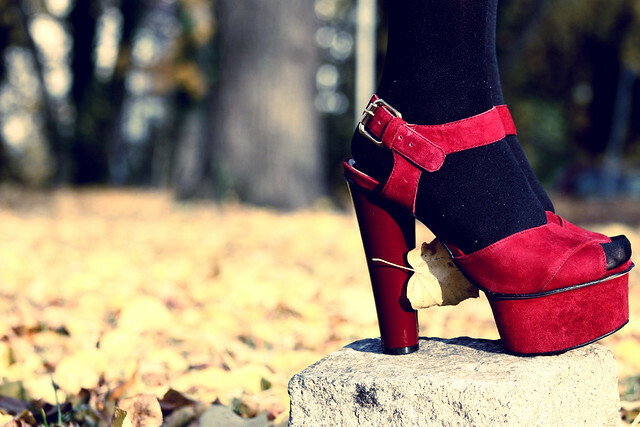 Those shoes are incredible -- as are the photos on your blog! The photography is just beautiful. Anyway those red shoes are so freakin pretty. Your collection is probably the most lust worthy I've come across lol. Great sweater! Love your sandals, beautiful color! Wow, wunderschöne Bilder und ein ebenso tolles Outfit!! MY ROCCO JUST GOT A BABY BROTHER, DIEGO. I PUT MY BLUE JEANS ON. H&M Home Afterwork Christmas Shopping Event. what happens in soho house, stays in soho house.